If you have at least 2link, the memory cost of GS Sherman M3 is 0, even if it is not installed. While @LeaPlath's analysis is technically correct (the best kind of correct), I think it is a little narrow, because it doesn't take into effect the fundamental purpose of barrier ICE. All Barrier ice ends the run, and for the vast majority that is all they do. Sometimes the ETR is conditional on a trace or psi game, or can be clicked through, or requires that the runner is tagged, but ultimately the sole purpose of a barrier is to keep the runner out. But, this takes different forms in the earlier part of the game versus the later part of the game. In the early part of the game, the runner is trying to find their breakers and get their board set up. Meaning, if they don't have a fracter, an Ice Wall is an impassable obstacle. In this part of the game, the corp wants to be using the cheapest barriers they can, to stop the runner at the lowest possible cost. Ice Wall, Himitsu-Bako, and Wraparound are probably the most popular barriers that fit the "gearcheck" archetype. Once a fracter hits the table, the question is different. Now, a barrier will only keep the runner out if they cannot afford to break it. At this point, your "gearcheck" ice is not going to do much, since it will typically cost only 1 or 2 credits to get through. You will want to be using the big ice. Heimdalls, Curtain Walls or Hadrian's Walls, Ashigaru or Wall of Thorns: these open windows when the runner is too broke to both match their high strength and break their multiple subroutines. Sherman and Corroder each specialize in one of these areas, at the cost of the other. Corroder mows through most gearcheck ice at 1 each: but taking down an outside Curtain Wall will cost a whopping 11. In contrast, Sherman eats a Curtain Wall for only 8...but the minimum cost to break any ICE is 2, or 4 if it's strength 2 or higher. But that's a poor trade to make, generally. Because gearcheck ICE typically gets rezzed early, frequently over central servers, you can expect to break a cheap barrier 3 or more times over the course of the game as you put pressure on HQ and R&D. On the other hand, big screw-you barriers will typically be played over the scoring remote, and you're only likely to actually pay through them once or twice. This means that, in the long run, you are typically coming out way behind using Sherman instead of Corroder. On top of that, while almost every corp runs gearcheck ice to protect their centrals, many corp archetypes don't bother with the expensive ice. HB or NBN fast advance, Jinteki shell game, Weyland murder, and many others spend their efforts on other tactics besides "build a big scoring remote and win". But that doesn't mean there aren't good reasons to run Sherman. It's in-faction for Sunny, letting her spend influence other places. It's 0 for anyone with 2 (like Sunny), letting you install non-icebreaker programs like Datasucker or Multithreader without needing to spend money and card slots on memory. It has the "cloud" subtype, which lets you get a ton of value out of Security Chip to make those big hail-mary runs in the endgame. Basically you need to ask yourself: "Am I willing to pay 4 to break a Himitsu-Bako?" and if you're willing to accept that possibility in exchange for some MU and link shenanigans, then maybe Sherman is justified. Maybe. I've been looking at this card and thinking, is it better than the multi-deck staple barrier breaker, Corroder. So I ran some maths, I took each barrier breaker in the game, assumed 3 for all the barriers which grow stronger, such as Next Silver and the results are interesting. On average, to break every piece of Ice in the game, Corroder will cost 4.225. In total (not including barriers that change types to become barriers), it costs 131 Credits. In comparison, Sherman will cost 4.45 on average. It can break every piece of ICE in the game for 138. Corroder is cheaper on 17 pieces of ICE. Sherman is cheaper on 11 pieces of ICE. They cost the same on 3 pieces of ICE. 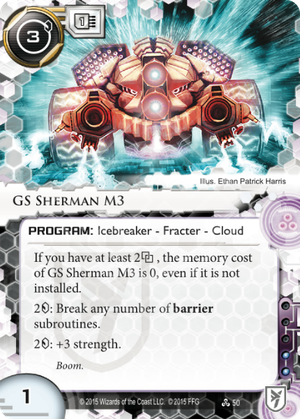 On top of this, Sherman costs 3 to install and is out of faction for everyone, which means stretching influence even further in a deck like Anarch. So Sherman is just strictly worse, right? Also, with a Datasucker, you can make Sherman much much easier. Reducing strength by 1 to get a barrier into the 1-4-7 range saves you a whole 2 credits, which helps negate one of Sherman's issues. So if you haven't tried Sherman yet and you are running Corroder and Datasucker, while being out of Anarch faction, give Sherman a try.